The twelve projects that are part of the European Commission “Ocean of Tomorrow” call from the Seventh Framework Programme have just published the second newsletter detailing most updated results for the ongoing projects. The aim of the OoT call is to combine the efforts of various interested parties from a broad range of sectors in order to develop innovative marine technology for a wide variety of applications. NeXOS will be present at the IEEE OCEANS 2017 ABERDEEN, 19th - 22nd June 2017, Aberdeen, Scotland. The OCEANS conference is the flagship event of the IEEE Oceanic Engineering Society (OES) and the Marine Technology Society (MTS). It features all aspects of oceanic engineering, science and technology. The prestigious OCEANS series of conferences is recognised as the premier forum for the international marine community to meet and discuss topical issues in a format of easy information exchange. OCEANS brings together engineers, scientists, managers and policy makers from all aspects of the oceanic spectrum and features an associated trade exhibition with companies and institutions representing the wide range of activities found in the marine community. The twelve projects that are part of theEuropean Commission “Ocean of Tomorrow” call from the Seventh Framework Programme have just published a newsletter detailing partial results for the ongoing projects. The aim of the call is to combine the efforts of various interested parties from a broad range of sectors in order to develop innovative marine technology for a wide variety of applications. NeXOS presented at the AGU 2016 FAll meeting, 12th - 16th December 2016, San Francisco, USA. AGU’s Fall Meeting is the largest Earth and space science meeting in the world. Fall Meeting brings together the entire Earth and space science community from across the globe for discussions of emerging trends and the latest research. The technical program includes presentations on new and cutting-edge science, much of which has not yet been published, offering a unique mix of more than 20,000 oral and poster presentations, keynotes and workshops. Representatives from NeXOS project will present the last progresses under the framework of the FP7 EU program "Oceans of Tomorrow", describing the process of sensors integration into platforms, by using standards and protocols from the OGC SWE framework. NeXOS presented at the OCEANS conference and exhibit, 19th - 23rd September 2016, Monterey, USA. Lennard Frommhold, a MS student from the NeXOS' partner University of Oldenburg in Germany, concluded a three-month internship period at PLOCAN, from May to July 2016, funded by the Erasmus+ program of the European Commission. The main objective of the training period was to develop a datalogger for the integration of NeXOS sensors two different offshore platforms: a WaveGlider and a buoy.The student tasks included the assembly of hardware components and programming of the main PC board and the final testing of the full communication system in lab and in the harbour of Taliarte. Oceans are complex and many types of observations are needed to understand their environments. Obtaining widespread observations has been generally difficult and costly in time and resources. 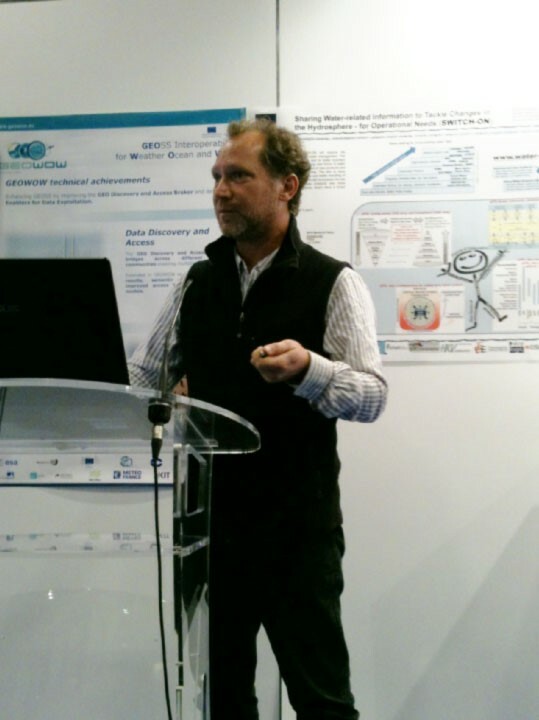 This presentation will address emerging sensor technologies and multifunctional sensor systems supported by the NeXOS European Project and other initiatives, with emphasis on optical methodologies to support biogeochemical observations. Click here to view the webinar. Nexos project partners will participate at the next GEO Workshop for European projects on Earth observation, which will take place on the 31th of May-2nd of june 2016 in Berlin, Germany. Read the full news for abstract and details. Please click here for more information and register your participation. We are pleased to confirm Nexos participation at the Oceanology International 2016, which will take place on the 15th-17th of March 2016 in London. The OI2016 is a global event, bringing together over 8,400 industry professionals from 82 countries and it offers the world’s leading forum where industry, academia and government share knowledge and connect with the marine science and ocean technology communities through exhibitions and conferences. Nexos will be present under the “Ocean of Tomorrow” projects from the FP7-OCEAN-2013 call and several partners will be showing the current developments of acoustic and optical sensors. Click on the news to read more about our participation. We are pleased to inform you that Nexos project will participate at the next European Geoscience Union General Assembly, which will take place on the 17th-22nd of April 2016 in Vienna. Please register here to confirm your participation. The EGU General Assembly 2016 will bring together geoscientists from all over the world to one meeting covering all disciplines of the Earth, planetary and space sciences. The EGU aims to provide a forum where scientists can present their work and discuss their ideas with experts in all fields of geoscience. Attached you can find the abstract of our presentation. Ocean research and seafloor exploitation require in situ sensors for research and modeling and to monitor and control undersea industrial operations. In all of these applications, biofouling of the sensors’ transducer interfaces is a high and persistent barrier to long-term data-gathering. Marine observing systems are composed of a huge diversity of sensors and observation platforms. Managing the massive data flow from sensor to user requires standards protocols— to facilitate integration of new sensors into existing platforms and to improve discovery and visualization of data. (Position now closed) The post-doctoral fellow will work in the Environmental Chemistry and Physical Oceanography teams at the MIO in Marseille (France) (http://mio.pytheas.univ-amu.fr/) as part of a group developing Coastal Mediterranean Observations with gliders equipped with physical and optical biogeochemical sensors. This work will use data from a number of past and current cruises that focus on physical and biogeochemical processes in NW Mediterranean, including impact of contaminants. Now available the presentations given at the conference 'Ocean of Tomorrow projects: what results so far? This conference is a unique opportunity to give visibility and showcase first results of ambitious multi-disciplinary projects with a focus on innovative technologies to support the development of sustainable maritime activities. It explores complementarities and synergies with projects in such diverse sectors as maritime security, innovative sensors to monitor the marine environment, offshore aquaculture or offshore wind energy. The conference includes also a panel discussion with industry representatives and public authorities to debate Blue Growth, emerging opportunities and new challenges within the maritime space. NeXOS has been selected together with the other Ocean of Tomorrow projects for this conference such as TROPOS, PERSEUS, LEANWIND or COCONET. The main objective is to present new, integrated sensors that can be implemented on a variety of fixed and mobile platforms and have multiple functionalities including measurements of key parameters useful to a number of objectives, ranging from more precise monitoring and modeling of the marine environment to an improved assessment of fish stocks. The workshop is based on the need for innovative sensors to improve and expand marine observations as part of a more comprehensive approach ecosystem management. Objectives of the project in developing new passive acoustics sensors were presented at the Second International Conference and Exhibition on Underwater Acoustics in Rhodes, Greece. Focus of the session, co-organised by NeXOS coordinator Eric Delory, was on the use of autonomous underwater vehicles for monitoring sound. The objectives of NeXOS in this field are to produce two new sensors, one of which will be compact and able to monitor and, or classify several variables from gliders and profilers for the purpose of ocean biodiversity monitoring and the assessment of underwater noise from human activities. There is a special opportunity for discussion of sensor requirements for next generation ocean sensors - focused on optical and passive acoustic technology for in-water observations. NeXOS, an FP-7 project sponsored by the EC, is a four year effort to design, build and test new measurement capabilities. NeXOS will sponsor a sensor requirements session at EGU 2014 addressing the next five to ten years for optical and passive acoustic sensors. The Group on Earth Observation (GEO) Plenary and Summit were held in Geneva on January 13-17, 2014. A declaration was approved to continue GEO for an additional ten years until 2025. The European Commission, an important sponsor of GEO, had a booth in the GEO exhibition showing their major contributions to GEO. The booth highlighted 7th Framework projects and other activities. The Kick-Off Meeting took place on October the 30th and 31st of 2013, at PLOCAN’s premises in Telde, Gran Canaria, Spain. With more than 35 attendees coming from each of the participant countries in NeXOS, this meeting represents the official launch of the Project.